To ensure proper growth and to keep your garden healthy, now is the time to feed woody landscape plants along with fruit and shade trees. Also, make sure you feed backyard citrus trees, as they oftentimes suffer from starvation or scale. If you’re thinking about renovating your lawn or garden, now is the best time to take action. Make sure you sod, plug, or seed lawns this month. It is also important to power rake Bahia lawns if not already done. Since the weather is warmer and bugs have made their presence known, you should check all plants and lawns for insects. Use Neem Oil or Acephate for mites. For mole crickets in bahia grass use Turf Ranger or Bifenthrin available in sprays or granules. Treat St. Augustine grass for chinch bugs now that hot weather has shortened their gestation period. While you’re checking and treating for bugs, make sure to also check for diseases, drought, and lack of fertilizer in your lawn and plants. If you see a plant is not thriving and you’re not quite sure why, you can always come down to Dot Farm and Garden Supply in Winter Haven, and we’ll help you as best we can. Once all the needed renovations have been completed, it is time to focus on planting annuals for color and cut flowers. 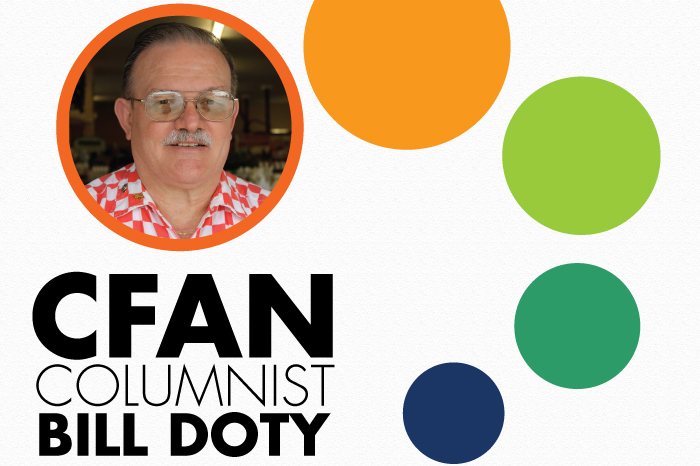 This column is sponsored by Doty Farm and Garden Supply. BIO: William R. “Bill” Doty is owner of Doty Farm and Garden Supply, Inc., founded in Winter Haven in 1954. Bill graduated from Winter Haven High School and Florida State University. Growing up, he was a student of the family business. He learned valuable lessons in listening and asking questions. Bill shares his knowledge with his customers daily and with readers of Central Florida Ag News monthly.